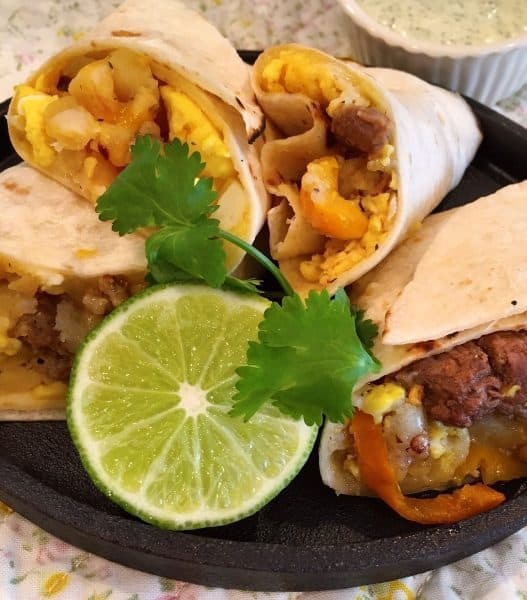 Make Ahead Freezer-Friendly Breakfast Burritos are loaded with fajita steak or sausage, golden hash browns, sweet peppers, onions, fluffy scrambled eggs, jack cheese or cheddar, and wrapped up in a lightly toasted flour tortilla. They’re basically the BEST thing since…well…scrambled eggs! The “big deal”? 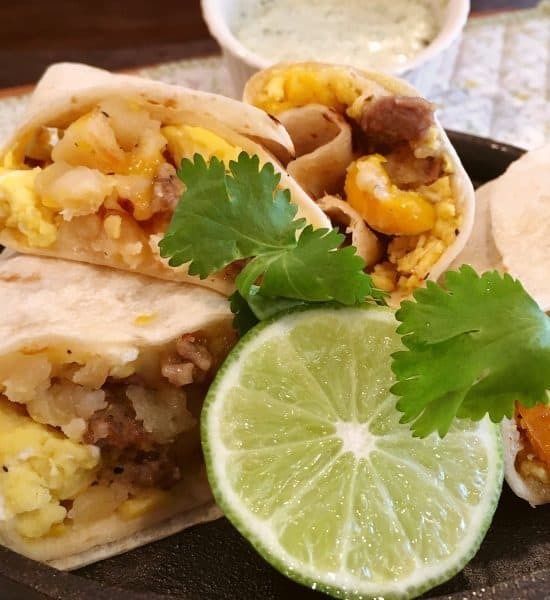 These breakfast burritos’ are made in bulk, ahead of time, and are freezer-friendly! It allows you to make a BIG batch to have on hand. Plus… they’re a much healthier choice than your favorite “fast food” joint and for about the same cost. I make these all in ONE pan! Just follow the steps…Let’s do this. Note: Before we begin I made two different types of burritos because I knew “Mars” would want steak with a little kick. Between the two I ended up with a 25 soft taco size burritos. The ingredients I’m sharing is to make both. If you just want one type then cut the recipe in half. 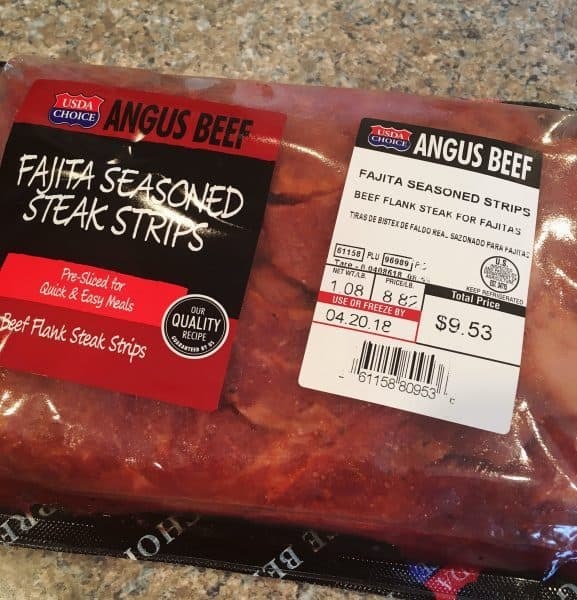 I purchased a 1 lb package of this Angus Beef Fajita Seasoned Steak Strips from Walmart. Cut the strips into chunks. Add 1 Tablespoon Vegetable Oil to a large skillet and heat over medium high heat. 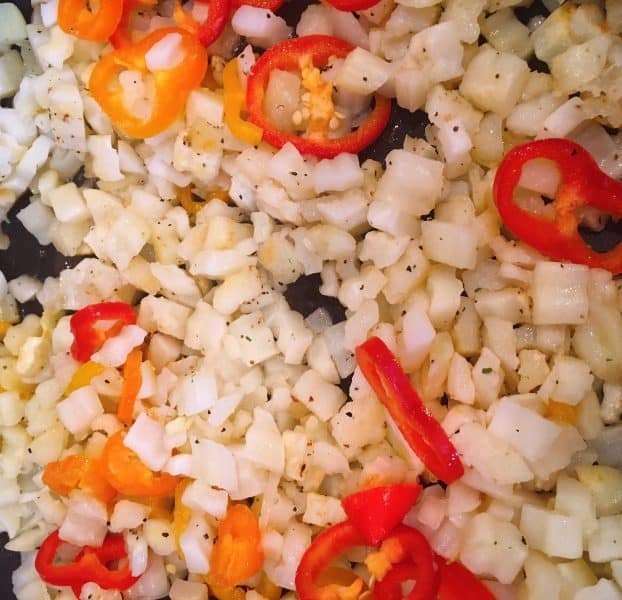 In the same skillet add the chopped onions and sliced peppers. Note these are “sweet” peppers. The husband is not a big fan of bell peppers, but he loves the subtle flavor of these little sweet peppers. 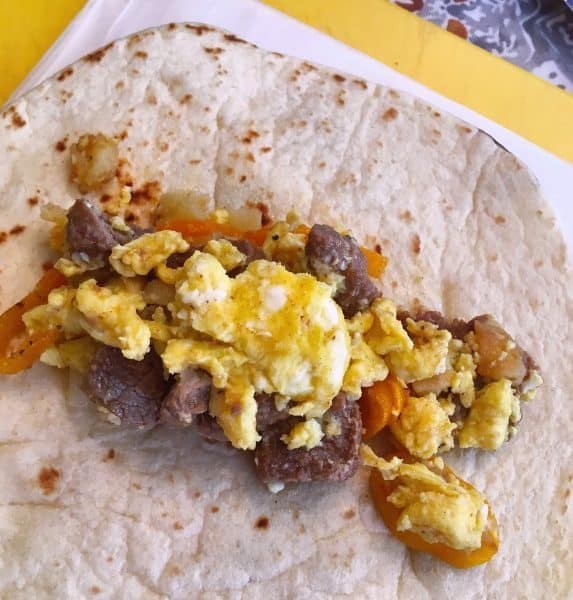 I have to agree the add a wonderful flavor to these Breakfast burritos’. Saute until tender crisp. Add 4 Cups Country Hash Browns, Garlic Salt and Coarse Black Pepper to taste. Stir frequently, until potatoes are lightly golden brown and tender. You may need to add more butter or cooking oil to finish cooking. Place ALL your eggs in one basket! lol Okay seriously…I want you to crack ALL those eggs and place them in a large bowl. Add Salt and Pepper to taste. (About 1/8 – 1/4 of each). 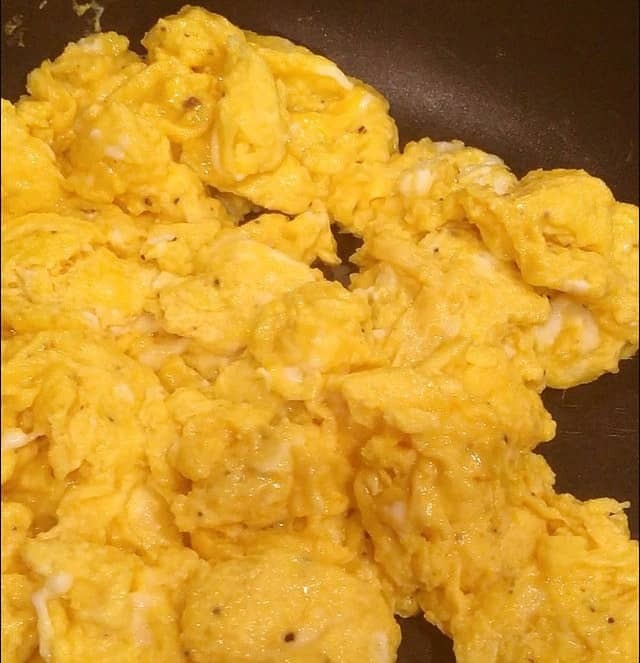 TIP: Let’s talk Scrambled Eggs. 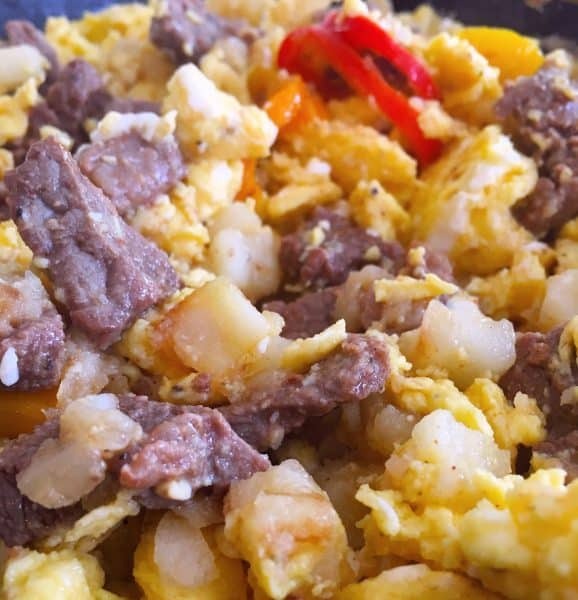 Everyone has their favorite way of making scrambled eggs. 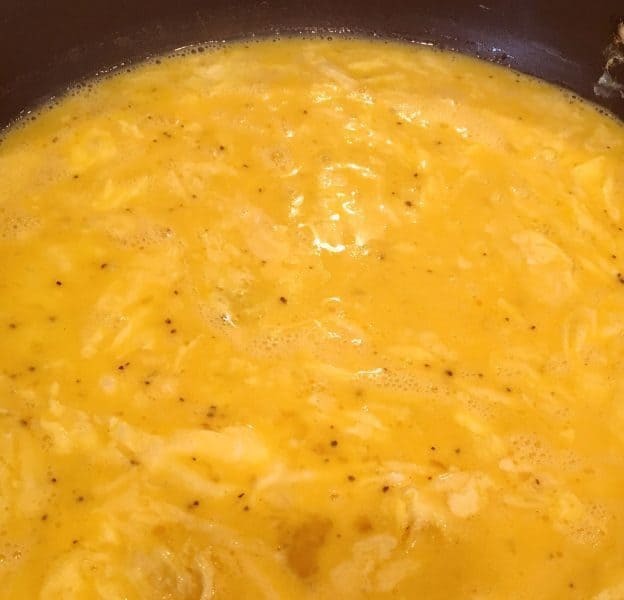 Adding “Cream or Milk” to eggs will give you creamier scrambled eggs. Which is fine. Adding water…which is my preference…will give you “fluffier” scrambled eggs. 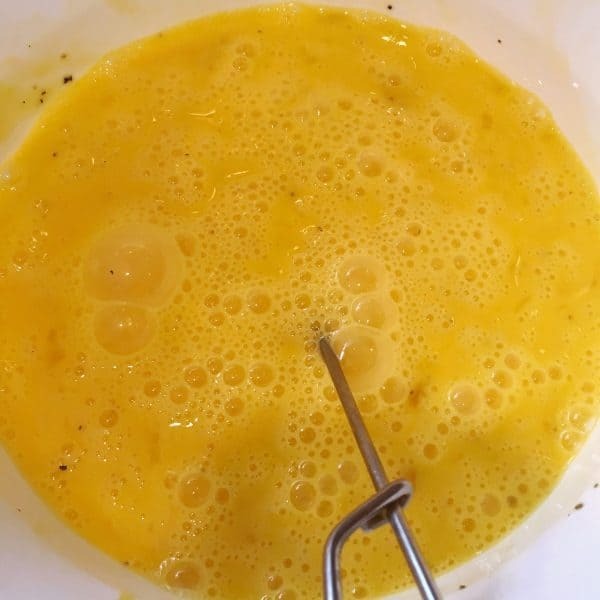 Add 1/4 cup of water to your eggs and beat with a whisk until foamy. Melt 2 tablespoons of butter over medium low heat. Pour egg mixture into skillet. Using a rubber spatula scrape eggs from sides and bottom, repeat until eggs are lightly cooked. Note the soft folds in the egg mixture. That’s what you’re looking for my friends. If they are slightly under cooked that’s great. Remember…they will be “reheated” and that will add additional cook time and make them perfect. Divide Eggs in Half. Place one half in a large bowl. Keep the other half in the skillet. In your large skillet add half the potato mixture and all the steak. I said…excuse me…add ALL the Steak! I see you! In the large bowl, combine the other half of the potatoes and sausage with eggs. Heat the Soft Taco Size Flour Tortillas. I lightly toast mine over an open flame on both sides until lightly golden. Lay a tortilla down on a flat surface. Place a large scoop of filling down the center of the tortilla. Add your choice of Cheese. I used Pepper Jack with the Steak and Cheddar with the sausage. Fold one end up about 1/4 of the way. Roll one side over the filling and then roll to other side. Now here comes my secret tip to help you keep these fresh and tasty when storing and reheating! Wrap a piece of parchment paper around the outside of the burrito! 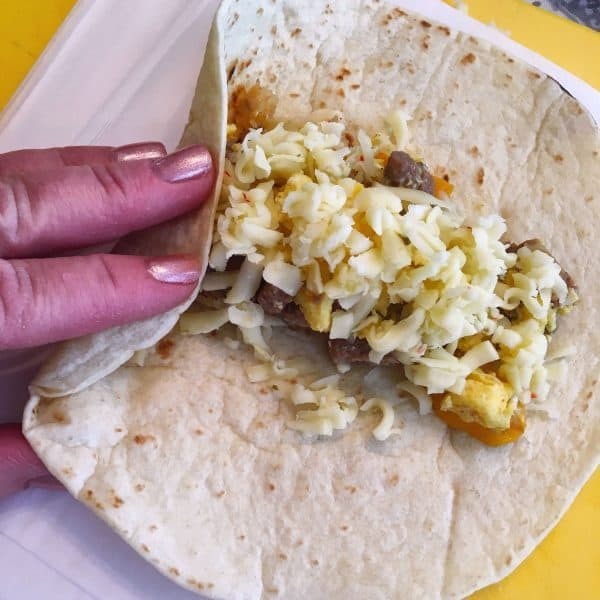 You can purchase Reynolds Parchment sheets and cut them in fourths and they are the perfect size for wrapping around the outside of the burrito. I wrap all my burritos in parchment first and then go back and wrap them in plastic wrap. Next, wrap tightly in plastic wrap! I used a piece of tape to mark the sausage from the steak. I didn’t want to use a marker and have the fumes penetrate the plastic wrap. YUCK! 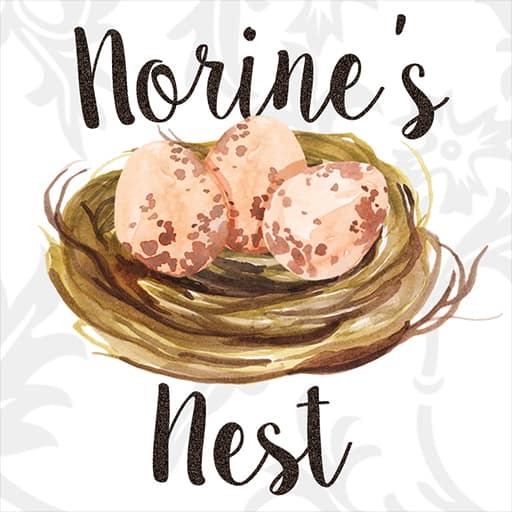 For this Nest, I Placed half in a gallon size zip lock bag, and placed them in the refrigerator for breakfast all week. The other half went into another gallon size zip lock bag in the freezer for later this month. To reheat, remove plastic wrap. Leave parchment paper wrapped around burrito. For fresh burritos’ in the refrigerator, place in microwave on high, for 45 seconds. Remove parchment and Enjoy! To reheat frozen burritos, remove plastic wrap, keep parchment paper on burrito. Place in microwave, on high, for 1 minute 20 seconds. Check center. If still slightly frozen repeat for another 5 seconds. These are truly Fantastic! The combinations of flavors is out of this world. It’s a great “stick with ya” breakfast. Something I think kids need before going off to school. Shoot! It’s something we all need in this “skip breakfast” century! We demand so much out of our bodies and give so little back. A healthy hearty breakfast is a GREAT way to start the day. These can be eaten in the car on the way to school, or work. You can serve them at home with salsa or sour cream. Big bonus…NO KITCHEN CLEAN UP every morning! You do it once and your done! Remember your choice of fillings are unlimited. If the birds at your Nest prefer Ham…switch out the meats for ham. Just want egg…just make egg and cheese. They are totally customizable. Which is great! I hope your family enjoys this delicious filling breakfast as we do! It’s been a great time saver and a great piece of mind for me knowing that the first meal of the day my love is eating has come out of my kitchen prepared by my hands! Thanks for stopping by! 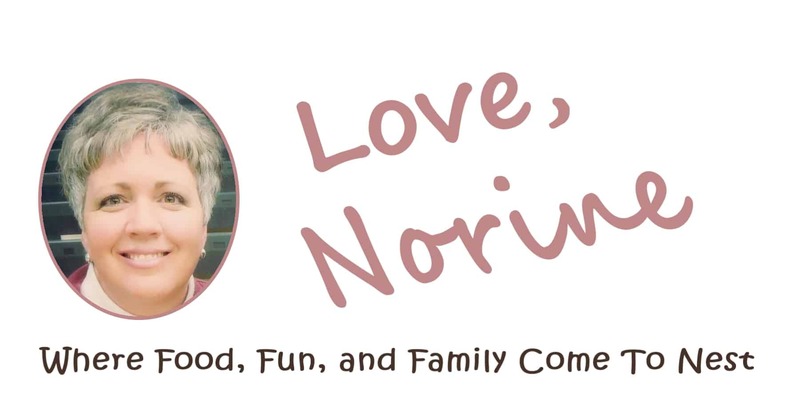 I love to hear from you so feel free to leave a comment or ask any questions below. 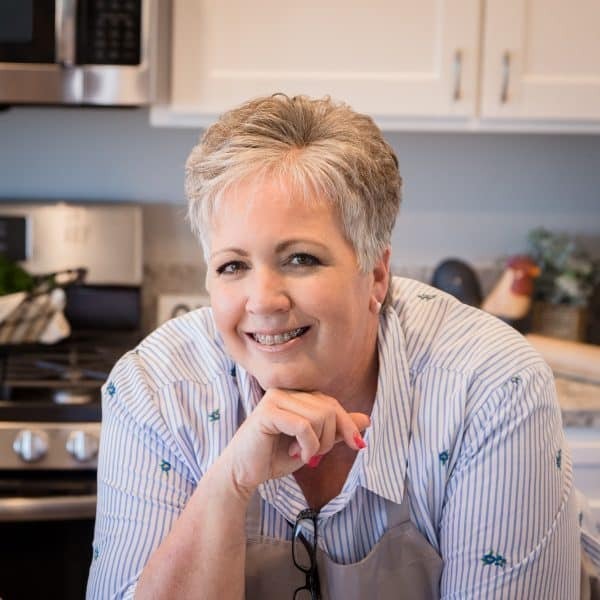 Remember you can always follow me on Facebook, Instagram, and Pinterest. Sharing this fun recipe over on The Weekend Potluck. Click HERE to join the fun. I’m sharing this delicious recipe over on Meal Plan Monday! Click HERE to find it and all kinds of fantastic recipes. Happy Nesting and Happy Breakfast! 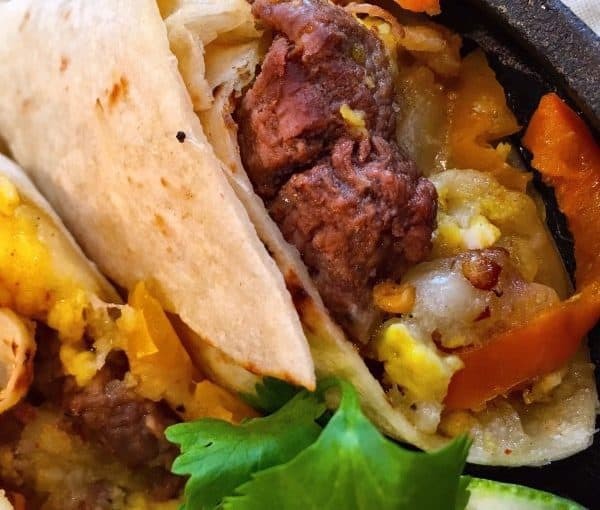 Start the morning off with these easy make ahead freezer-friendly Breakfast Burritos. Flour tortillas are loaded with steak or sausage, golden hash browns with onion and sweet peppers, lightly scrambled eggs and cheese. The perfect "on-the-go" breakfast! *Please Note if you are only making one type of burrito you'll need to cut the remaining ingredients in half, minus the meat. In a large skillet over medium high heat add 2 Tablespoons vegetable oil. 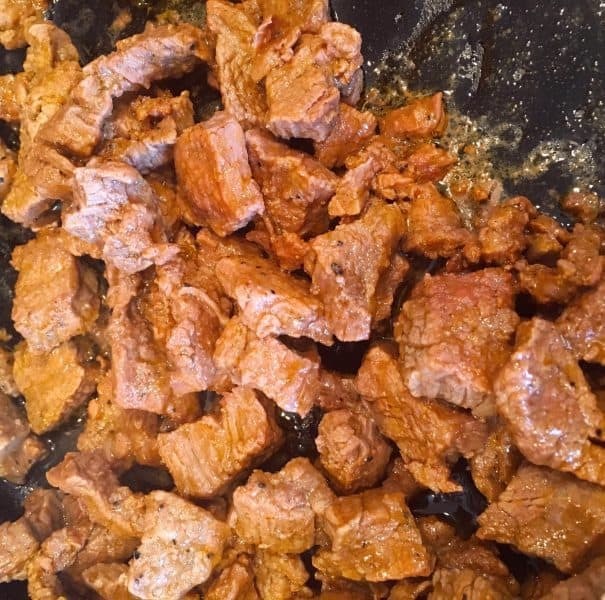 Cook steak cubes until done. Remove from skillet and set aside. 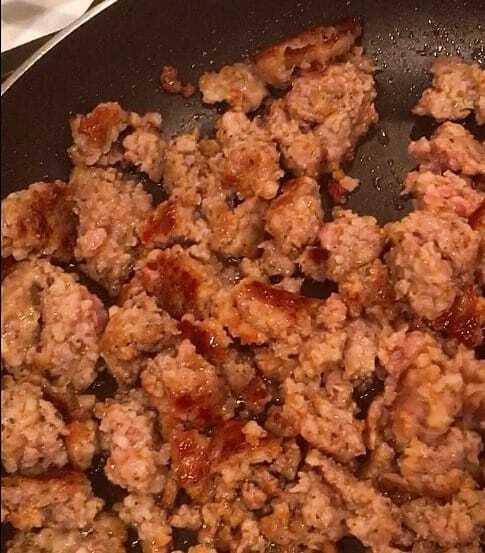 In same skillet brown sausage until crumbly and completely cooked. Remove from skillet and set aside. In same skillet over medium high heat add 2 Tablespoons oil. Add onions and sliced peppers. Saute until tender crisp. Add 4 cups of Hash Browns and cook until lightly golden brown and tender. You may need to add extra butter or oil to brown. Season with Garlic Salt and Coarse Black Pepper to taste. In a large bowl crack and scramble all 18 eggs. Add 1/4 cup water, salt and pepper. Whip with wire whisk until light and foamy. Divide cooked eggs in half. Keep one half in original skillet. Place the other half in a large bowl. Add half of potatoes to each of the scrambled eggs. In the skillet add the steak. In the large bowl add the sausage. Mix each container well. Heat tortillas over open flame until lightly golden or heat in microwave until soft. On a flat surface lay a flour tortilla. Add a large scoop of steak and egg mixture. Top with a healthy pinch of Pepper Jack Cheese. Fold bottom up 1/4 of the way. Fold one side of tortilla over the filling and roll towards the other edge. Cut Reynolds Parchment Squares into fourths. 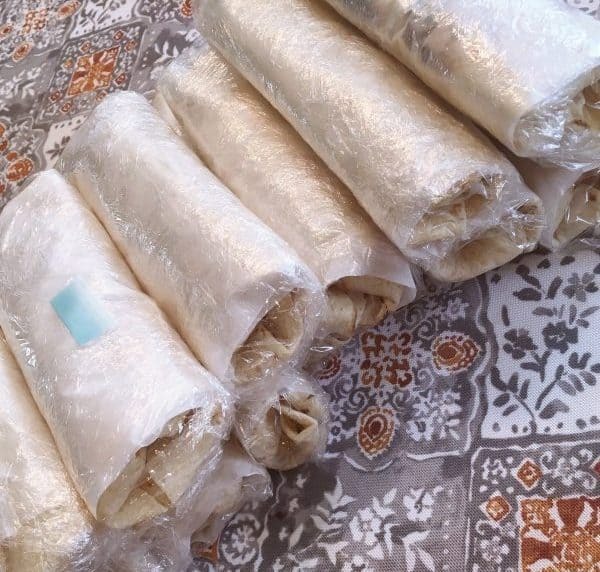 Roll burritos in parchment paper and then wrap tightly in plastic wrap. Mark each burrito. Place in Freezer bag and freeze. You can also divide them in half and place half in the refrigerator and half in the freezer. 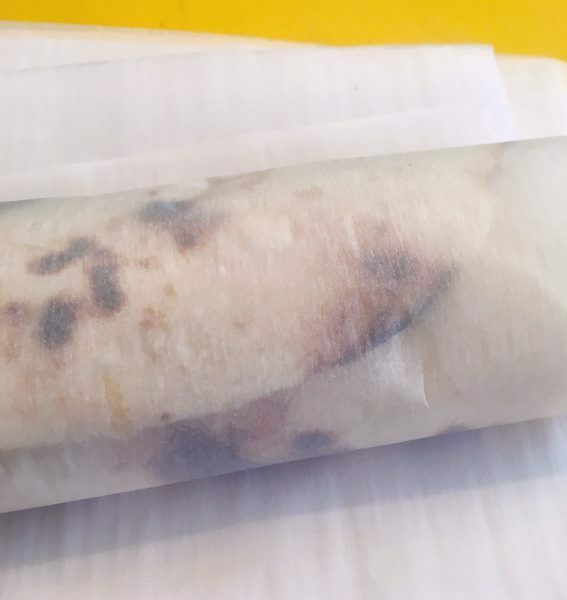 To reheat fresh burritos' in the refrigerator. Unwrap from plastic wrap. Keep parchment wrapped around the burrito. Heat for 45 seconds on high. To reheat Freezer burritos remove plastic wrap. Keep parchment on burrito. Heat in microwave on high for 1 min and 20 seconds. Check center to see if it is done. If not repeat for 5 more seconds. These sound delicious!! I had to share on Facebook and save it to my recipe folder! Thanks for sharing on Meal Plan Monday! Thank you for sharing this on Facebook! I truly appreciate it. These have been a life saver around here the past couple of weeks. Thank you for stopping by and sharing with me. I always love to hear from fellow Meal Plan Monday lovers! Have a GREAT week. 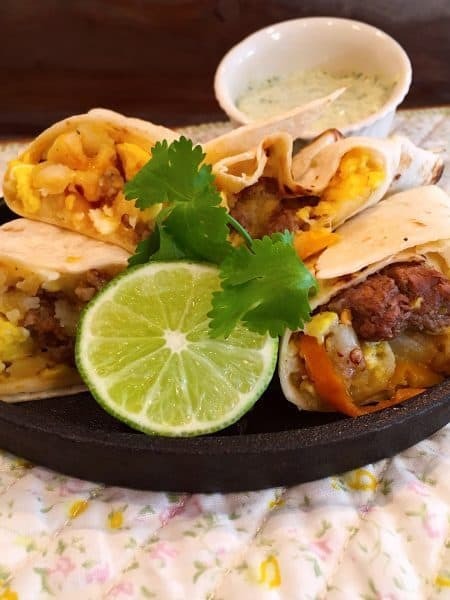 These breakfast burritos sound fabulous and the fact that I can freeze them to use later is even better! It is so nice to have something on hand. You have quite the sense of humor. I really enjoyed your post. I did find this recipe on Kitchen Thyme, even though I feel like we are already friends. Thank you for sharing. We are friends! Thanks so much for stopping by and chatting with me. I’m just getting caught up after our trip to Texas for the funeral. You are so sweet to leave me a comment and be so supportive! You’re the best! Hope you have a GREAT week and love these burrito’s as much as we do. I think I make them every other week…so handy! I make these all the time. I like to microwave 1 minute before eating and then remove parchment paper and put into my air fryer (toaster oven would be great too) and crisp up the tortilla shell just a little- delicious!! Thanks so much for sharing that tip. I love the idea of using your air fryer to toast them! Awesome!